Pyridine occurs in coal tar in around 0.1% form from which it is obtained commercially. On monosubstitution, pyridine makes three isomers. There is a requirement to pay special attention to the nomenclature of the derivatives as the common names are in general used. 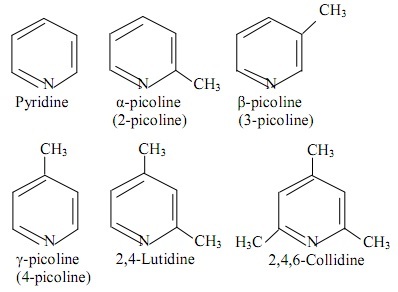 For illustration monomethylpyridine are termed as picolines, the dimethylpyridines as termed as lutidines and trimethylpyridine as collidines. The α-, β- and γ-pyridine carboxylic acids are termed to as picolinic, nicoctinic and isonicotinic acids correspondingly. The Pyridine can be isolated from light oil fraction of coal tar. This fraction includes pyridine, alkyl pyridine, aromatic hydrocarbon and phenols. Whenever the oil is treated by dilute tetraoxosulphate (vi) acids, pyridine and other fundamental substance are dissolved. The aqueous acid layer is neutralized by solium hydroxide when based are discharged as a dark brown oil liquid. The oily layer is separated and pyridine is obtained through fractional distillation. It comprises the condensation of a 3-dicarbonyl compound (2moles), an aldehyde (I mole) and ammonia (I mole) to provide a dihydropyndine derivative. 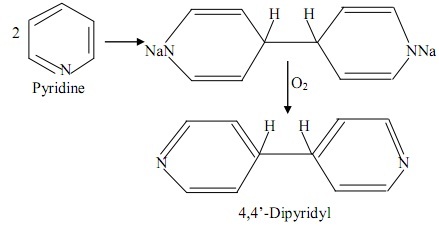 This derivative can be oxidized by nitric acid to outcome the pyridine derivative. e) When acetylene, formaldehyde hemimetylal and ammonia are passed over alumina - silica catalyst at 500oC, it yields pyridine. Industrially, pyridine can be obtained from the catalytic reduction of furfuryl alcohol by ammonia at around 500oC. Pyridine is a coloniless liquate (boiling point115oC). It is miscible with water in all proportion. This is hygroscopic in nature. This is a good solvent for numerous organic and inorganic compounds. Pyridine is a base (pkb 8.8) of comparable strength having aniline (pkb 9.4). This is a stronger base than pyrrole (pkb = 13.6) however much weak than the aliphatic tertiary amines (pkb = 4). The basic character of pyridine is because of the availability of the lone pair of electrons on hetero atom nitrogen. Therefore it reacts with alkyl halide to yield quaternary salts. Due to the great electronegativity of nitrogen atom, it decreases electron atom density of the ring (-I effect), therefore deactivating the ring. In acidic medium, it prepares a pyridine caption by a positive charge at way atom and this nitrogen reduces the election density much move efficiently - therefore deactivating the ring. The position -3 is though the least effective and is relatively the position of highest electron density in pyridine. Because of the decrease of electron density on ring carbon atoms, pyridine is rendered susceptible to the nucleophilic attack. The nucleophilic substitution take place readily at the 2 and 4 positions as these positions are much more electron deficient than the position 3. 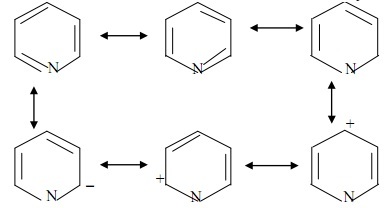 The pyridinium ion is more reactive than pyridine toward nucleophilic substitution owing to the presence of the full positive change. 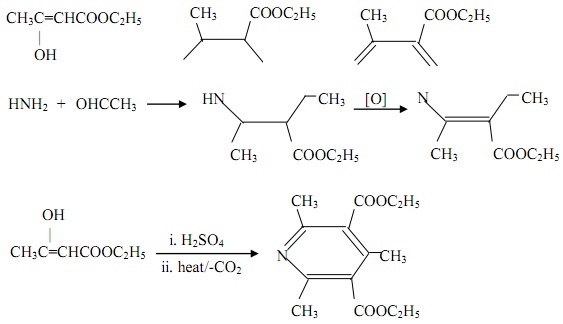 The below scheme summarizes the nucleophilic substitution reaction of the pyridine. This is oxidized via hydrogen peroxide or per acids to its N-oxide; pyridine-1-oxide is a resonance hybrid and undergoes nitration reaction at 4-position unlike pyridine. a) By SO3, Pyridine makes a stable complex with sulphur trioxide. 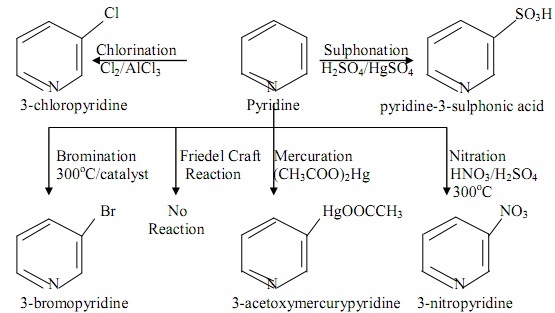 This complex is employed in the sulphonation of acid sensitive substances. b) On treatment by sodium, two molecules of pyridine add to form a di-sodio derivative that whenever exposed to air yields 4, 4'-dipyridyl. Small amounts of 2, 2'-dipyridyl is as well obtained. 1) Employed as solvent and mild base in numerous organic reactions. 2) Employed as a denaturant for ethyl alcohol. 3) For control of plant pests. 4) Employed in the preparation of medicinals such as sulphapyridine, isoniazid and so on. 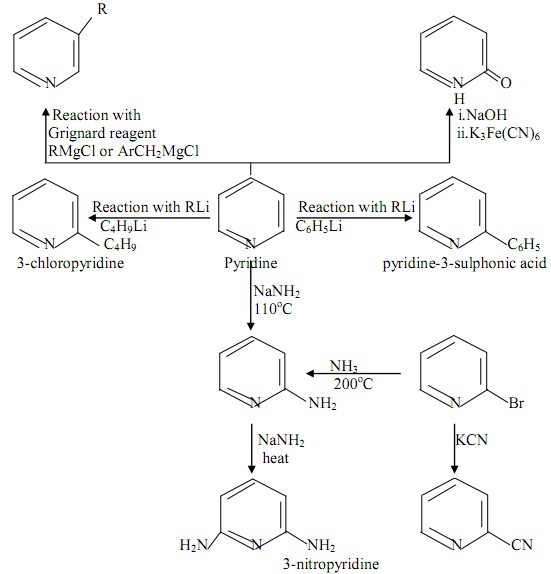 5) As a catalyst in the preparation of Grignard reagents and in the Perkin and Knoevenagel reactions. 7) Employed in the recognition of metals. 1) The molecular formula of Pyridine is C5H5N. b) Its neutralization equivalent exhibits it is a monoacid. c) It doesn't react by acetyl chloride or HNO3 exhibiting the absence of primary or secondary nitrogen or amino group. d) It reacts by one mole of methyl iodide to make a quaternary ammonium salt N-methylpyridinium iodide. a) Resistant to the addition reactions. b) Resistant to common oxidizing agents. a) Its alkyl derivatives are readily oxidized to pyridine carboxylic acids. 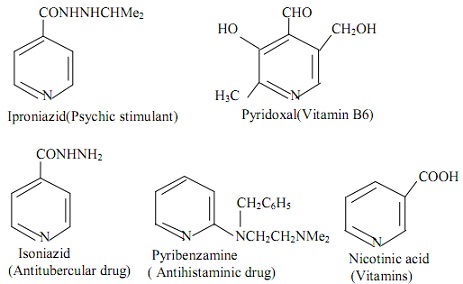 b) The amino derivatives of pyridine can be diazotized and coupled by phenols or amines and so on such as amino benzene. c) The halopyridine exhibits nucleophilic displacement of halogen by -NH2, -OH, -CN and so on similar to the halogen of halonitrobenzenes. The whole carbon, nitrogen and hydrogen atoms lie in the similar plane. The four carbon-carbon bond lengths in the pyridine are equivalent- 1.39? and the carbon - hydrogen bond length are equivalent37?. It resists addition because of the absence of true double bonds. Because of the presence of positive charges at 2- or 4- position in the contributing structure, it acts as deactivated system in the electrophilic substitution that occurs at position-3. Its resonance energy is around 23 kcal/mol as compared to -6 kcal/mol in ordinary conjugated trienes. From the molecular orbital theory, the nitrogen and each of the carbon atoms in pyridine are in the sp2 hybridization state. 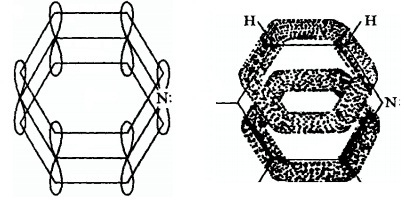 They combine altogether to make a ring employing two of their sp2 hybrid trigonal orbitals for making α-bonds. The remaining sp2 orbital at five carbon atoms overlap by s-orbital of hydrogen to make σ-bonds whereas the third sp2 orbital of the nitrogen includes the lone pair of electrons that remain unshared. The unhybridised p orbitals at each of the carbon and nitrogen atom overlaps by each other to form π cloud of electrons below and above the plane of the ring similar to in benzene. Though, due to greater electronegativity of nitrogen, the π- electron cloud is relocated slightly towards the nitrogen and electron density is below unity at all the carbon atoms. Position three is the least influenced and it is the position with the highest electron density, making it the favored place for electrophilic substitution. The given are the names and formulae of significant derivatives of pyridine that are of physiological and medicinal significance.